This interview recorded for Chris Brennan's Astrology Podcast features Demetra and Chris talking about her life's work in astrology. In this pre-recorded webinar, Demetra talks about the intention behind her 2016 Summer Astrology Retreat in Portland, OR. She describes the format of the workshop and material to be presented. The retreat will be presented at the historic Kennedy School in Portland, OR from July 11 through 15, 2016. 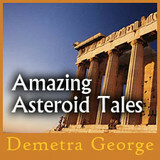 Demetra George was interviewed by Keny Bye for Engaged Heart on Rising Signs in Traditional Astrology in 2010.